This update has an important fix for the account sync feature. Every single time I see the stupid notification "would you like to rate our app?" I immediately click no because if I really thought it was worth writing a review for, I wouldn't need to be asked. But it popped up today and I HAD to. I LOVE this app. I bought an Apple Watch not too long ago, not really knowing all of the benefits of it, while simultaneously trying to find things I could do with it. I found this app in the watch App Store and after downloading it, I am not kidding - it changed my life. I am an INCREDIBLY forgetful person. And also not very good with routine. That being said, I have to take certain medications every SINGLE day around the same time to get the full effect of them - but like I said, I am all over the place and rarely have routine in my life. This app changed that. Every morning I wake up and I am EXCITED to check off the medications I need to take, like I'm playing a game with myself: how many days can you go taking it at the right time? It's motivating in a way that I couldn't get motivated on my own to have a routine that benefits my life way more than just a simple click of a button. Thank you so much to all of those who helped create this application - you have helped me in more ways than I can explain in this review. 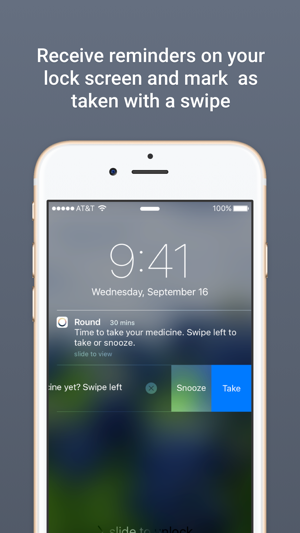 I just started living a medicated life and was very worried that I would not be able to find an app or method of tracking that was both functional and beautiful (ux designer here). This app is wonderful! I love the interface and the aesthetic choices made. I also love the usability of the entire app. I like the fact that you can have a nickname for your meds so your notifications aren’t showcasing your medications. 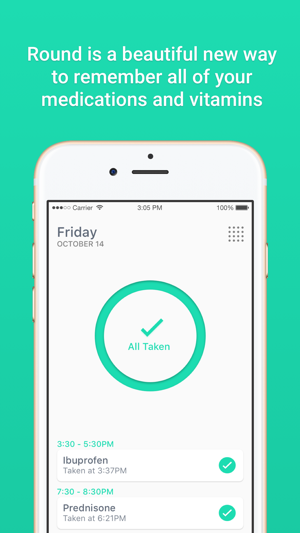 The calendar tracker and the ‘tap to take’ formats are amazing. The notifications are prompt and remind you again if you forget. All around a great app; I am happy to have found it! Cons: so far I have not been able to actually sign in and register my account. It always says that’s unavailable and to try again later...but that’s it; everything else is amazing! Requests: An “I’m starting this medication on a future day” feature. While I like the current reminder format and schedule, sometimes you have to start meds on a future day and pre-scheduling that out so it reminds you the day you start it or a reminder the day before that you’re beginning that regimen soon would be great. Also, some meds have an “ease in” method like ‘take one a day and then two a day’ adding that feature would awesome. 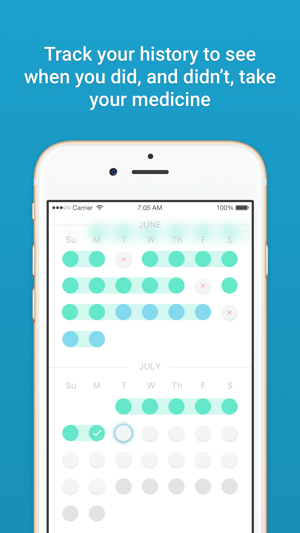 I love the Round app and it’s honestly the only app I’ve been able to find that I like the design of. 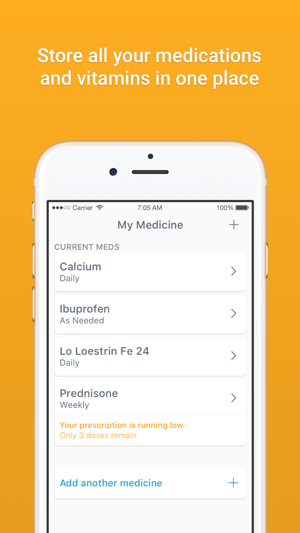 Most medication apps are overly complicated and don’t work for people who take a LOT of various meds. 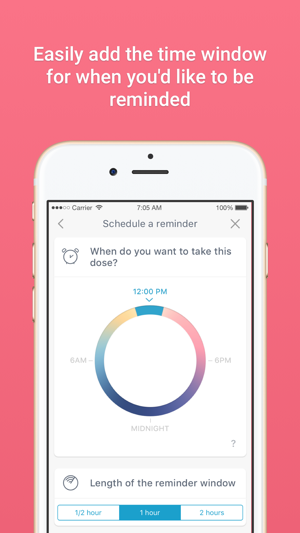 Round is perfect for me - it keeps track of medications wonderfully, and I love the timer on my as needed medication. It’s very customizable and easy to see all the information you need at a glance. I also love that the medication list is so simplistic that I can just hand my phone over to the nurse whenever they ask what medications I’m on which definitely saves time at doctors appointments. My only complaint is that the app has quite a lag to it. Especially as you add more and more medications for it to keep track of. I’d love to see the app sped up because it can be quite a hassle to be waiting and waiting for an app to load multiple times a day when I take my meds. It also has a glitch where the meds don’t line up properly which means you have to completely restart the app, which is even more annoying. I love Round SO much but if it gets any slower and crashes any more I’m not sure I’ll be able to keep using it. I hope they release an update that fixes these problems soon.